PICTURED ARE Katie Schmit, left, and Renee Farmer, right. On Wednesday, Jan. 24, the one-act play from Sanborn Central participated in the region One-Act Play contest in Huron. The play, “Grandma Rosie”, is a three-scene play about a 94-year-old woman who is losing her memory and needs help from her family. 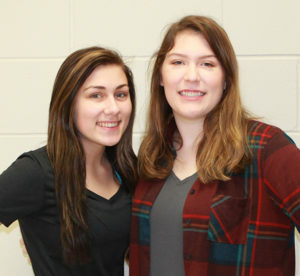 Although the play didn’t advance, two students received superior acting awards: Renee Farmer for the part of Rosie and Katie Schmit for the part of Sara. The play was presented to the student body at Sanborn Central on Tuesday. Other cast and crew included Koby Larson, Madi Moody, Cole Moody and Abby Vermeulen. Catherine Bechen and Samantha Dean were the light crew.